If a quality offensive lineman is available with the Lions’ first pick at 23rd overall, they could jump at the chance. Martin Mayhew does look for the best available player when their time comes, so while they may not be seeking a first-round offensive lineman they probably would not shy away from drafting one. If there’s any doubt remember they drafted DT Nick Fairley last year with the 13th overall pick, even though the defensive line was solid. While the Lions intend to re-sign LT Jeff Backus, at some point they have to look to the future. They have no problem with how the offensive line played in 2011, but age is creeping up on them. Center Dominic Raiola is 33 and Backus is 34. Both are sturdy, ironmen type of players but they can’t play forever. If the Lions draft a first-round tackle, Mike Adams out of Ohio State might be the best bet. Or maybe the Lions will pass on a tackle. NFLdraftscout,com had Adams rated as the fourth best tackle available behind USC’s Matt Kalil, Iowa’s Riley Reiff and Stanford’s Jonathan Martin. If they look for a guard, Stanford’s David DeCastro would certainly be tempting. However, there’s a good chance he’ll be gone by the 23rd pick. A more likely possibility at a guard who could be available at 23rd is Georgia’s Cordy Glenn who is ranked as the second best guard in the draft by National Football Post and NFLdraftscout.com. The father of Andre Fluellen, the Lions’ versatile defensive lineman, died after a charity basketball game on Saturday, according to the Cartersville (Ga.) Daily Tribune News. The Rev. Charles Fluellen, age 57, died of an apparent heart attack after playing in the “Pastors vs. Politicians” basketball game. The paper reported that the Rev. Fluellen complained of chest pains and lost consciousness during the game. Funeral arrangements will be handled by Mack Eppinger & Sons Funeral Home in Cartersville, according to the newspaper. It appears there is one name we can eliminate from the Lions’ draft discussion. 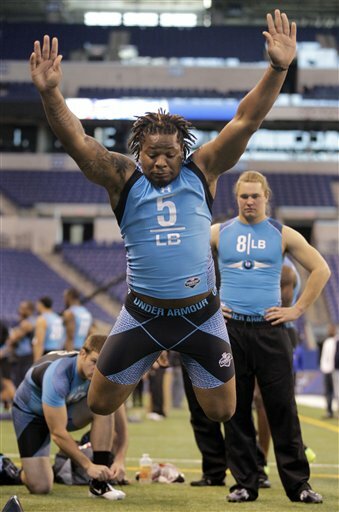 That’s Arizona State linebacker Vontaze Burfict who has had a horrible showing at the NFL Combine. His official time in the 40 was 5.01. According to Bruce Feldman of CBS Sports his interviews were lousy too. “The guy is completely out of control. There’s no way you could trust him. I can’t believe they (ASU coaching staff) didn’t cut him loose,” one scout told Feldman. Draft analyst Mike Mayock didn’t think much of Burfict before the Combine so to some this is no surprise. Let’s put an end to the Burfict to Detroit talk. It will be interesting to watch the stock of cornerback Janoris Jenkins following the Combine. Jenkins had been pegged as the Lions’ first-round draft pick (23rd overall) in many mock drafts. Jenkins spent his senior season at North Alabama after getting dismissed from the Florida Gators for continuing drug issues. Baggage? He’s got a trunkful. Plus he’s got four kids. His children are ages 3 to 3 months. He is 23. He made a splash at the Senior Bowl. There is no doubt about his talent. But he had to convince teams he had straightened up his life. Will he succeed? Just heard a great Calvin Johnson story from when he was at the 2007 NFL Combine, thanks to the NFL Network. He had decided not to run so he loaned his shoes to quarterback James Pinkney to use. Then Johnson came onto the field through the tunnel, saw the lights and decided to run. Johnson found the QB, got his shoes back and then ran a 40 in 4.38. Certainly a lights-out moment at the Combine. Now the salary cap looks to be an issue for the Lions and many other NFL teams. Team president Tom Lewand tried to calm fears about limited cap space when he had a conference call with season ticket holders two weeks ago. He compared looking at the Lions cap space to looking at a still shot from a movie. It’s just part of the story. “We have to look things as they fit today but we also have to project out into the future,’’ Lewand said on that call. They will create space by restructuring contracts. Calvin Johnson is mentioned most often because they are working on an extension (he has just a year left) and along with that will restructure his payments. Give Lewand some credit here. Before he was team president and before he led the way on the construction of Ford Field, Lewand was known as the salary cap guru for the Lions. While this cap is different, Lewand has years of experience in figuring out how to stay under the cap. The Lions want to keep players like Cliff Avril, Stephen Tulloch and Jeff Backus. They’ve been very clear about that. Those players should not have to take hometown discounts, the Lions know that. There should be a way to fit them in and do it before free agency opens on March 13. The Lions’ first draft pick is at 23rd overall this year which will also help. Along with the fact that the new CBA includes a rookie salary cap. Cornerback Cortland Finnegan and Lions coach Jim Schwartz have a history. Finnegan played for the Tennessee Titans when Schwartz was the defensive coordinator. So it’s a natural progression to wonder if Finnegan, a free agent, will be wooed by the Lions who have needs in the defensive backfield. 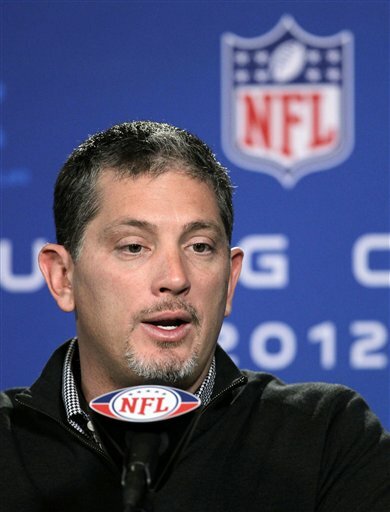 According to reports from the NFL Combine in Indianapolis, Schwartz would not say if the Lions are interested. But he also didn’t dismiss the suggestion when he addressed the media on Thursday. The Lions have a cap situation with about $11 million available. If they slap Cliff Avril with the franchise tag it would eat up most of that. The cap number is a fluid situation, but it could be tough for the Lions to find a way to sign Finnegan. In other words, don’t get too excited. Free agency opens at 4 p.m. on March 13. Ndamukong Suh and his shenanigans will continue to be a topic of conversation until he proves he’s matured in the 2012 season. Coach Jim Schwartz addressed reporters at the NFL Combine this morning (Thursday) and it was one of the questions he was asked, according to reports on Twitter. Schwartz said Ndamukong Suh played very well, but Thanksgiving and some of the other things that happened “overshadowed” his productivity. Of course the Thanksgiving game is when he stomped on Green Bay’s Evan Dietrich-Smith and was subsequently suspended for two games. His sack and tackle numbers were down dramatically from his rookie season. We’ve been told by Lions management that this is not a concern. If he’s suspended again, I would suspect the concern level would be raised. It would be easy to dismiss the value of the NFL Combine if you think of just a few players who didn’t perform well yet succeeded when they had a chance in the NFL. One in particular, Tom Brady who was the seventh quarterback selected by the Patriots in the sixth round of the 2000 draft. Brady was the seventh quarterback selected. He had a horrible Combine showing — slow, no vertical jump to speak of. Well, history speaks for itself. The NFL Combine starts Thursday in Indianapolis and it’s a key time for every NFL team. It’s not just the first-rounders that matter. They grab the headlines — if you haven’t heard quite enough about Andrew Luck, just wait for the next several weeks — but filling up on late-round talent is what can make or break an NFL general manager. The Lions have had plenty of draft busts, many during the Matt Millen era. So far Martin Mayhew has to be proud of the three Lions’ drafts under his direction. 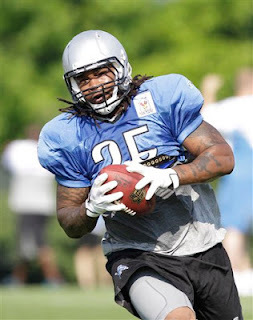 He didn’t always take the player that the fans thought he would, especially last year with Nick Fairley. But he’s restocked the cupboards stripped bare by Millen’s bad drafts. Mayhew, JIm Schwartz and the rest of the staff will be busy early morning to late night for the next several days in Indianapolis. The fruits of their labor will show April 26-28 at the draft. 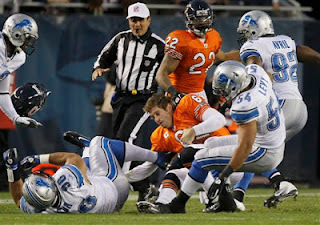 What do the Lions have to do to earn respect in the NFL? It remains a big question. Cris Carter disrespected Calvin Johnson during the season saying he wasn’t one of the top five wide receivers in the NFL. Now Hall of Fame running back Marshall Faulk, an NFL Network analyst, is dumping on Matthew Stafford’s achievement of passing for 5,038 yards last season. He is in elite company, one of only four quarterbacks to reach the 5,000-yard mark— Drew Brees (twice), Tom Brady and Dan Marino. Yet Faulk is not impressed. Johnson, who proved Carter wrong, led the league with 1,681 receiving yards and was second in touchdown catches. He was elected to the Pro Bowl. Stafford was forced to pass more often because the Lions’ running game was a problem area. That didn’t make it easy, it made it tougher and still he succeeded and was named the NFL’s Comeback Player of the Year. Going into this year’s NFL Combine and NFL draft is a little different for the Lions and not only because their first pick doesn’t fall until 23rd. Three years ago they couldn’t make a mistake deciding which position to bolster through the draft because the roster was like Swiss cheese, full of holes. Now the Lions’ needs are more specific. Picking the best available player is within reason, though. Lions president Tom Lewand confirmed this week that they will not draft a quarterback with the 23rd pick in the first round. The Lions drafted Jahvid Best late in the first round of 2010 even though he had a history of concussions. He missed the final 10 games plus the playoff game this past season with concussion issues that may or may not be related to his past. The only problem with drafting Mikel Leshoure last year in the second round is that they didn’t project he would tear his Achilles on a fluke play during training camp. 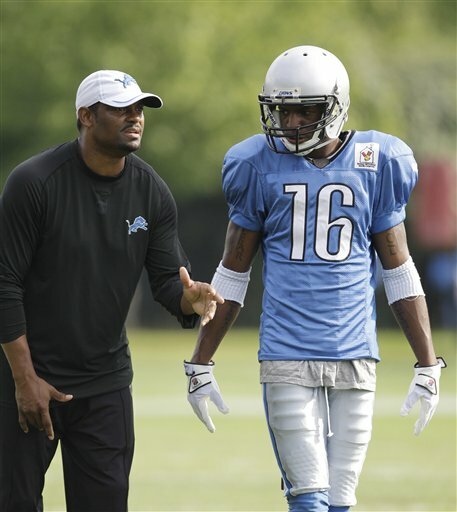 Like most football folks, McShay sees the Lions needs at cornerback, offensive line and linebacker. Left tackle Jeff Backus is expected to return, but he is 34 and has played a ton of football, 176 games over 11 years without missing a start. At linebacker Stephen Tulloch, one of the Lions’ best defensive players last season, is a free agent as is Bobby Carpenter, a solid backup linebacker. The NFL Combine is next week with the NFL Draft held April 26-28. For Lions fans this used to be like Christmas, the best time of the year. Now that the Lions are winning it’s a little different. Important, but different. For more on potential first-round cornerbacks Janoris Jenkins and Dre Kirkpatrick, see TheOaklandPress.com. 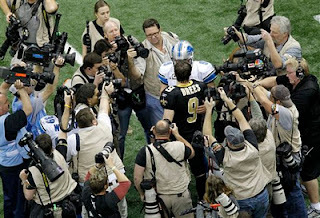 It’s almost funny how the NFL lockout is rarely discussed. A year ago at this time we were hanging on every word from both sides. Now it’s clear that rookies were the biggest victims of the lockout which left them with no off-season work with coaches and teammates. One of those was Lions wide receiver Titus Young. He got injured in training camp, but his development and contributions to the team early on would have likely been better with some off-season work. “He’s a guy at a position that’s really one of the toughest for a rookie to play, wide receiver in the NFL. You don’t just go out there and run routes, they have to learn all the adjustments , they’ve got to learn how to play more physical than they don in college. That’s generally a tough adjustment that first year,’’ Lions president Tom Lewand said this week. Lewand said he expects Young to have a big offseason getting in more work with Stafford, offensive coordinator Scott Linehan and wide receivers coach Shawn Jefferson. Lewand said they expect Young to be a more critical part of the offensive equation. 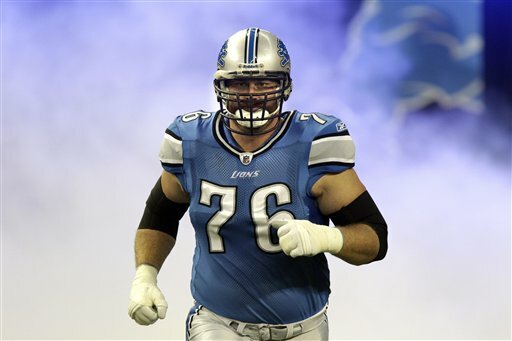 Jeff Backus, the Lions’ ironman left tackle, is expected to be ready for training camp after undergoing surgery at the end of the season. The veteran, who could become an unrestricted free agent, tore a biceps muscle in the playoff game at New Orleans. “He has been recovering incredibly well. It was a longer term recovery but fortunately that longer term involved the offseason,’’ team president Tom Lewand said in a conference call with season ticket holders. Backus was drafted in the first round in 2001 out of Michigan (18th overall) and has never missed a game or a start which puts him at 176 straight. “Jeff has been a warrior for us his entire career, he holds the marks for us for consecutive starts and now that we’ve got things going we’d like Jeff to be a part of some of these successes,’’ Lewand said. — Discussions have started with Cliff Avril, Eric Wright, Jeff Backus and Stephen Tulloch, all unrestricted free agents. NFL free agency opens on March 13. — Running backs Jahvid Best (concussion) and Mikel Leshoure (Achilles) are rehabbing well and are expected to be able to participate in the offseason program which starts in April. At the same time Lewand said they will be on the lookout for running backs because they don’t want to put all their eggs in the basket of two guys coming back from injury. — Jeff Backus is recovering incredibly well from surgery just after the season to repair a torn biceps which he injured in the playoff game. — While Lewand applauds the NFL expansion to Europe, the Lions want no part of giving up a home game to play a game in London. They want eight home games for their fans. He didn’t say it, but of course they wouldn’t want to lose income from a home game either. — If a quarterback is the best player available at the 23rd spot in the draft, the Lions will not draft him. — Lewand said salary cap number is tough to explain. It’s a process, must keep within cap while projecting into future. Lions were one of 20 teams that borrowed from the cap in the 2011 season. We all knew that Ndamukong Suh’s reputation took a big hit when he stomped on Green Bay’s Evan Dietrich-Smith on Thanksgiving. Forbes magazine has the numbers to prove it. 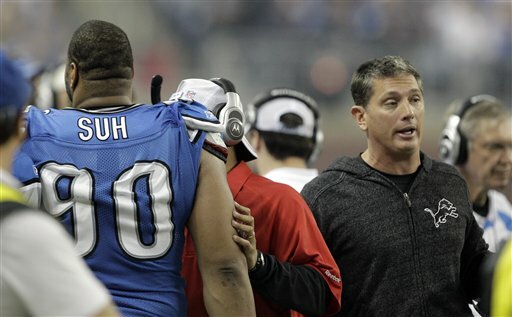 Suh is fourth on the new list of most disliked athletes behind Michael Vick, Tiger Woods and Plaxico Burress according to surveys conducted by Nielsen and E-Poll Market Research that measures public attitudes toward pro athletes. Oddly enough, last year Suh led the Nielsen-EPoll Survey of most liked players in the NFL. All that changed with The Stomp. “He went from being so popular to being a pariah in one season,” Stephen Master, vice president of sports for Nielsen, said in the Forbes story. Because he’s young Suh has plenty of time to improve his image. Those on the list scored most responses from people who described them as athletes they dislike, dislike somewhat or dislike a lot. Of the 327 players invited to the NFL Combine today, 11 are from Michigan universities. Michigan State had six: Kirk Cousins, Edwin Baker, B.J. Cunningham, Keshawn Martin, Trent Robinson and Jerel Worthy. Surprisingly Michigan State starting left guard Joel Foreman (Milford High School), who was all Big Ten in his senior season, was not on the invitee list. Michigan had three: Junior Hemingway, Michael Martin and David Molk. Wayne State’s Jeremy Jones was invited along with and Western Michigan’s Jordan White. The SEC has the most invitees with 53 while the Big Ten and Pac-12 each have 45. Last year 327 players were invited to the Combine and 254 were drafted. 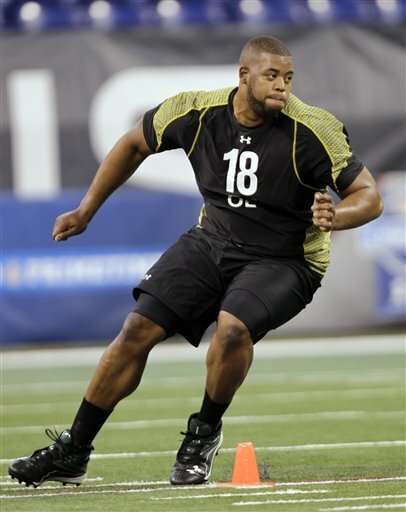 The NFL Combine will be held Feb. 22-28 at Lucas Oil Field in Indianapolis. In a quieter ceremony during Super Bowl week, Matthew Stafford won a prestigious honor when he was named Quarterback of the Year by the NFL Alumni Association. He beat out two elite quarterbacks — Tom Brady and Aaron Rodgers — for the honor. The show aired on the NFL Network on Monday night. “Any time an award like this is given out it's an individual award, but really it’s won by the team. I couldn’t have done it without the teammates and the coaching staff in Detroit. I'm just happy to be part of that team and be part of this,’’ Stafford said when he accepted the award. Calvin Johnson was nominated for wide receiver of the year but that was won by Hakeem Nicks. Stafford, who became one of only four quarterbacks ever to pass for more than 5,000 yards in a season, was named the NFL’s Comeback Player of the Year on Saturday night. That's the award he's holding in the photo. 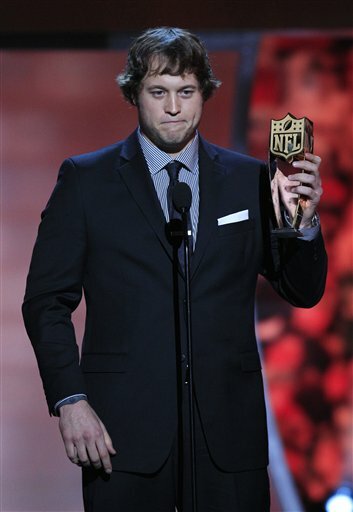 — Good to see Matthew Stafford get some recognition as Comeback Player of the Year. It’s not an award you aim to win, but it put him in the spotlight briefly which he deserved after a Pro Bowl snub. — Not a huge Madonna fan, but thought she was awesome. In interviews on Friday and Saturday she was legitimately nervous about pulling everything off. No wonder, it was such a spectacle. Hope “the finger incident” doesn’t take away from such a tremendous show. It shouldn’t. She’s 53 and, as my friend Jennifer Hammond pointed out, after 30 year she’s still relevant. — Don’t blame Gisele Bundchen for standing up for her hubby, Tom Brady. it’s not like she initiated it. She was provoked and it was the heat of the moment. Give the super model a break. — Don’t count out Tom Brady. 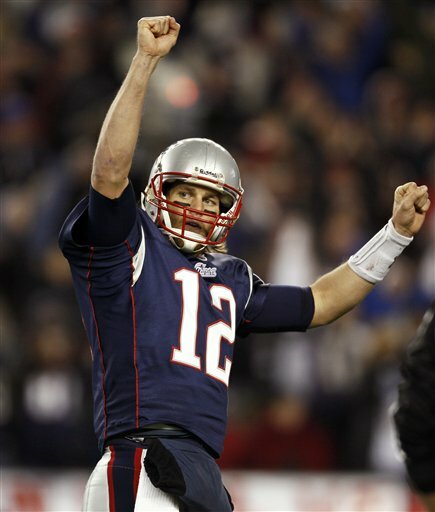 The Patriots are the favorites at 11-2 odds to win Super Bowl XLVII. Matthew Stafford came back from playing just three games in the 2010 season, to a full slate in 2011. Not only that his statistics were nearly off the charts, becoming one of just four NFL quarterbacks ever to throw for more than 5,000 yards in a season. Because of that Stafford is nominated for the NFL Comeback Player of the Year award which will be one of several awards presented Saturday night at the NFL Awards show. Red carpet preview at 8 p.m. on the NFL Network with the awards show starting at 9 p.m. on NBC. File this under: It’s about time. Remember that Titus Young touchdown catch at Green Bay on Jan. 1 that was ruled not a touchdown? The NFL does, and there’s a chance the rules may change so that won’t happen again. To refresh your memory, Young clearly had both feet down in the end zone when he made the catch. But the official thought he only had one foot down so ruled it wasn’t a touchdown. Coach Jim Schwartz had used his two challenges already so couldn’t challenge it. The Lions were robbed of a touchdown because the NFL rule was that all scoring plays were reviewed. Since that wasn’t a scoring play, it wasn’t automatically reviewed. NFL commissioner Roger Goodell told the NFL Network’s Rich Eisen on Friday that the league competition committee will look at changing that rule so that not only scoring plays are reviewed but also plays in the end zone that aren’t ruled a touchdown or a safety on the field. Goodell said the concern is that with more replays the pace of the game could be disrupted. Still wouldn’t it be better to get it right even if it extends the game time by a few minutes? The vote here is yes. 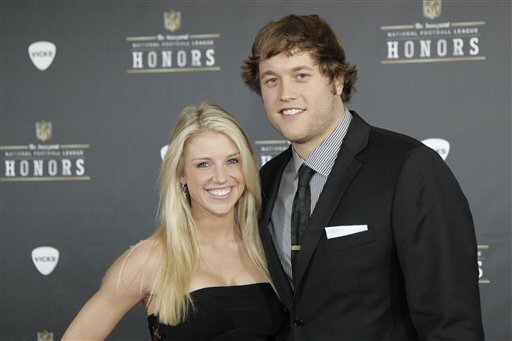 “Hopefully a Super Bowl ring,’’ said the 23-year-old Stafford who might have some explaining to do to his girlfriend. Stafford is in Indianapolis with many NFL top players for Super Bowl activities. He’ll be coaching in the Celebrity Beach Bowl on Saturday afternoon against Cam Newton’s team. Barry Sanders will also be involved as will Kurt Warner and Joe Montana. Patrick didn’t stump him when asked about how close the Lions are to winning it all. Patrick said now that the Lions have made it to the playoffs they expect them back next year. “I think we’re real close, I think we’re right there. Obviously, with free agency and the draft it’s always exciting to see who your new teammates are going to be. We’re as excited as anybody. I think our team is poised and ready to make that next step,’’ Stafford said. Saints quarterback Drew Brees was in the waiting room — actually waiting gym — along with Stafford who had nothing but praise for the quarterback who knocked the his Lions out of the playoffs. “I’m happy for him he’s a great guy. He’s a fellow Texan, I’m happy for him, happy for his career. Obviously I would’ve liked to win the game we played in. I have a lot of respect for him. 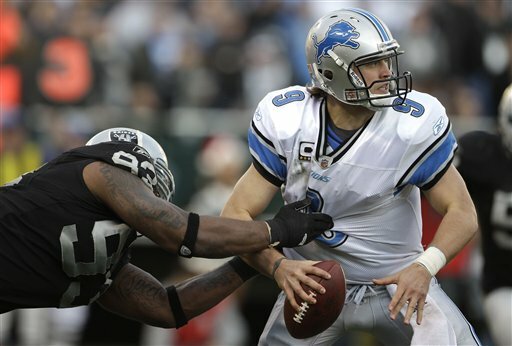 He does some unbelievable stuff on the field and he’s a great guy off of it,’’ Stafford said. 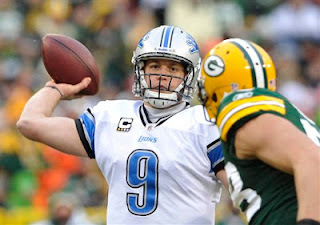 He also had praise for the Saints’ offense, said it was a great offense for a quarterback to run and if he had to choose ... “Aside from the one I run in Detroit, probably the one he’s running,’’ Stafford said. We’ve been over this before, but not sure I’ve heard this story. Stafford’s high school team won the state championship 59-0 his senior year. He said he knew he had something special early on in high school. “My sophomore year, first game of the year I was going to split time with this other quarterback and the first quarter he started the game, I came in the second quarter and played well and ended up finishing the game out. Got offered by SMU the next day. I was like, ‘OK now maybe I’ll be OK,’’ Stafford said. Wednesday was national signing day and Stafford remembers his because he was already enrolled — or as he said enlisted — at Georgia. That was his plan because he wanted to play his senior season without being distracted. Matthew Stafford has a friend in Kurt Warner, a retired four-time Pro Bowl quarterback who was the MVP of Super Bowl XXXIV. Stafford is a nominee for the NFL comeback player of the year award which will be awarded on Saturday night, Super Bowl eve. Warner, who spoke in Indianapolis Wednesday, thinks Stafford is just getting started. "I think we saw this year his potential. Everybody knew he was talented; it was just, can he stay healthy for 16 games? If he can, let's see what he can do. Well, he can throw for 5,000 yards and 40 touchdowns,’’ Warner said, according to quotes on the Lions’ web site. “Along with the weapons he has, I don’t know what the limit for him is. That was a great year, a great year under the radar because of everyone else. That’s an MVP year in most seasons and he’s 23 years old. If he can continue that, and improve in some of those other areas, he’s going to be really, really impressive,’’ Warner said. 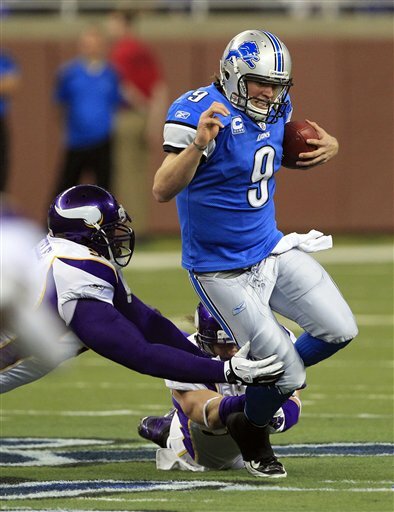 Stafford completed his first 16-game season in 2011 after being hampered by injuries in 2009 and 2010. He only played in three games in the 2010 season due to shoulder injuries which is why he's nominated for comeback player of the year.